Join the discussion on our forums! 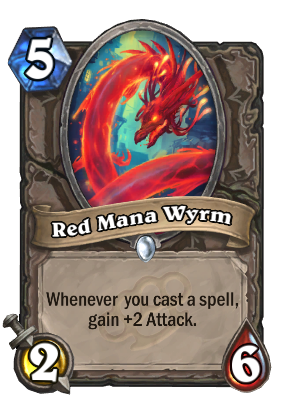 Come discuss Red Mana Wyrm over in our dedicated Red Mana Wyrm discussion topic. If they want to keep the flavor text accurate, the obvious move is to make this cost 10.
turn 4: 2x Radiant Elemental. turn 6: Play Shadow Visions, discover Shadow Visions, play it, discover it, play it, discover it, (etc.) attack face. REALLY dangerous with Lyra the Sunshard..
Edit: also be careful of Radiant Elemental + Shadow Visions shenanigans..you might end up dead on turn 6 after infinite Shadow Visions..just remove this damn wyrm immediately especially if facing priest or rogue.. This card is BUSTED. I laugh at people which don't realize it's potential. Vs priest you can even control the attack value, for example cast one spell to make it 4/6. They just can't deal with it without board, even dragonfire potion won't kill it and next turn they just die, Or take like 12 - 20 dmg. This probably wouldn't break anything at four mana. As-is it seems kind of meh, though maybe Rouges could stealth it and do something. I've yet to run into that, though. So what do you do to defend against a Rogue that stealths and in one turn buffs to 28 damage? Isn't that basically another raging worgen card that they nerfed because it was to powerful? If you let it get to that situation, you'd have been equally fucked if it was an Edwin VanCleef or a Questing Adventurer or even just two free Arcane Giants who were stealthed instead. Making an exaggerated situation in which this card is OP doesn't mean this card is OP. It's actually a little too expensive imo.